Chelsea manager Antonio Conte praised the club's fans for sticking by him, after a comfortable win over West Bromwich Albion at Stamford Bridge eased the pressure on the Italian. Conte's Chelsea future had been placed under the harshest spotlight after successive heavy losses to Bournemouth and Watford - but a victory that took them back up to fourth in the Premier League will ease those concerns for now. Conte's name was sung throughout by the home fans, in an obvious show of support. "I have to thank the fans because they showed me great support," he said. "They are reading speculation and rumours on me and I'm grateful to the fans. "It means they understand my passion, my will to defend this colour, this shirt, this badge. "I have to live with this pressure until the end of the season. I don't want this pressure to weigh on the shoulders of my players." Conte needed the brilliance of Eden Hazard to settle early uncertainty on the pitch and in the stands. Hazard exchanged passes with Olivier Giroud before giving Chelsea a first-half lead and, after Victor Moses slid home a second after the break, sealed victory with a powerful drive in the 71st minute. The win took the Blues a point ahead of fifth-placed Tottenham. West Brom, meanwhile, are seven points from safety after one win in 25 league games. They were hampered by losing loan signing Daniel Sturridge to injury inside three minutes. Substitute Jay Rodriguez wasted an opportunity to put them ahead when clean through, and Salomon Rondon and Jonny Evans also missed chances with the game in the balance. "Losing Daniel Sturridge after three minutes was a blow in itself," said Pardew. "That was probably a bigger blow than the result. "He felt his hamstring after a 60m sprint in the first moments of the game. We'll have to nurse him." For Conte, however, it was a satisfying night and the pressure - temporarily at least - is off. Conte walked out to take his place in the technical area with his future as Chelsea manager shrouded in uncertainty. The Italian insists he wants to see out the remainder of his contract - which runs until 2019 - and the club have not shown any inclination they want to bring his reign to an end just months after he won the Premier League in his first season. Yet there is the assumption the clock is running down to the end of the season and the conclusion of Conte's Chelsea career - perhaps even sooner had another poor result followed the heavy losses to Bournemouth and Watford. This was a fixture with the capacity to be troublesome, but Conte got what he wanted - and so did Chelsea's fans. If supporter reaction can be used as an accurate measure, Conte retains huge backing among the fanbase. His name echoed around Stamford Bridge inside the first minute, acknowledged politely by the Italian, and the noisy backing was repeated at regular intervals throughout a routine victory. There was certainly no shortage of touchline commitment from Conte, urging his players with actions and words throughout, boiling over at a tackle from behind on Giroud from Evans and even finding time to give substitute Alvaro Morata some very boisterous advice. But he will know he needs to keep winning, with an FA Cup fifth-round tie at home to Hull City, a Champions League last-16 meeting with Barcelona, and a visit to top-four rivals Manchester United to come. And Chelsea fans will know owner Roman Abramovich does not make managerial decisions based on the popular vote, rather with a ruthless, hard-headed approach that has ensured continued success. For now, though, the mood has lifted. Conte needed his big players to turn up to release the pressure that has been building around him. He has no bigger player than Hazard - and how the Belgian delivered. Chelsea started nervously but it was Hazard who broke the deadlock after 25 minutes to make life a lot easier for both his manager and the home fans. It was the result of a slick exchange with Giroud, who held his position with strength and awareness to play Hazard's pass perfectly back into his path for an emphatic finish. 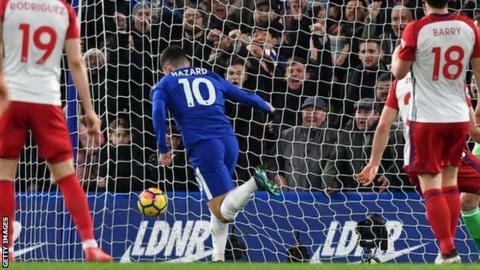 Hazard was central to everything Chelsea did, and it was another moment of magic 19 minutes from time that ended any slim hope Albion had of mounting an unlikely recovery. Baggies keeper Foster left a large gap towards his left-hand post but Hazard showed peerless technique and power to find it with unerring accuracy for Chelsea's third. On a satisfying night, Conte can also be pleased with the performance of Giroud, who not only assisted Hazard's first goal but acted as a focal point for the Chelsea attack and showed signs of early promise in his link-up with the Belgian. Sturridge was West Brom's high-profile January signing, designed to provide the goals and quality they need to stay up following his arrival on loan from Liverpool. And yet, in a scene played out with miserable regularity throughout his career, the England international was gone within minutes, and into what could be a lengthy injury lay-off. Sturridge was involved in his first action inside three minutes, a regulation chase and tussle for possession with Cesar Azpilicueta. The result was an ominous grimace and stumble before making his way forlornly down the tunnel. It is the latest disappointing chapter in the tale of injuries that have hounded Sturridge in recent years, his golden season alongside Luis Suarez at Liverpool just a distant memory. West Brom did not lack spirit, but when the big opportunities came they failed to take them, with Rodriguez and Rondon the major culprits when given clear sights of goal, and Evans heading a perfect chance wide from a corner. Manager Alan Pardew might take some encouragement from what might have been - but he needs more than that to rescue what is becoming an increasingly desperate position. Chelsea manager Antonio Conte: "It was important to get three points, especially after two defeats. The two bad defeats brought our confidence down and it was important to win and score three goals and keep a clean sheet. "To lose two games in a row in the league you feel confidence is going down. At the same time we have to try and avoid these situations and play our football. "We have to try and face this situation and be men and overcome this situation." West Bromwich Albion head coach Alan Pardew: "If we can get two or three wins in our next group of games we can put pressure on the other teams. "When you go to a top six team who are wounded a little bit, we had a great chance to hurt them. We missed a great chance and five minutes later we were 1-0 down. "We just couldn't hurt them. Once they got the second goal you could see the relief in the team and the crowd." Chelsea have won all four Premier League meetings against West Brom under Antonio Conte without conceding a goal. West Brom have not beaten Chelsea at Stamford Bridge in any of their past 17 visits in all competitions, since winning 1-0 in the League Cup in November 1983. Hazard has had a hand in 105 goals in the Premier League for Chelsea (68 goals, 37 assists) - only Didier Drogba (159) and Frank Lampard (237) have been involved in more for the club. Hazard has scored 10-plus goals in four of his past five Premier League seasons. Giroud became the first player in Premier League history to start a game for both Chelsea and Arsenal in the same season. Moses has scored two goals in his past three Premier League appearances, as many as in his previous 47 combined. Chelsea face Hull City in the FA Cup fifth round on Friday (20:00 GMT) and Barcelona in the Champions League on 20 February before their next Premier League game - at Manchester United on 25 February. West Brom are also in FA Cup action at the weekend, with Southampton visiting The Hawthorns on Saturday (15:00). Match ends, Chelsea 3, West Bromwich Albion 0. Second Half ends, Chelsea 3, West Bromwich Albion 0. Salomón Rondón (West Bromwich Albion) wins a free kick in the defensive half. Corner, Chelsea. Conceded by Grzegorz Krychowiak. Corner, Chelsea. Conceded by Jonny Evans. Foul by Álvaro Morata (Chelsea). Attempt missed. Victor Moses (Chelsea) right footed shot from the right side of the box misses to the left. Assisted by Álvaro Morata. Substitution, Chelsea. Willian replaces Pedro. Substitution, West Bromwich Albion. Claudio Yacob replaces Gareth Barry. Corner, Chelsea. Conceded by Ben Foster. Attempt saved. Álvaro Morata (Chelsea) right footed shot from outside the box is saved in the top right corner. Assisted by Eden Hazard. Corner, West Bromwich Albion. Conceded by César Azpilicueta. Substitution, Chelsea. Gary Cahill replaces Andreas Christensen. Goal! Chelsea 3, West Bromwich Albion 0. Eden Hazard (Chelsea) left footed shot from the right side of the box to the bottom right corner. Assisted by Álvaro Morata. Jay Rodriguez (West Bromwich Albion) wins a free kick in the defensive half. Attempt saved. Victor Moses (Chelsea) left footed shot from the right side of the box is saved in the centre of the goal. Assisted by Eden Hazard. Attempt missed. Jay Rodriguez (West Bromwich Albion) header from the centre of the box misses to the left. Assisted by Matt Phillips with a cross. Gareth Barry (West Bromwich Albion) wins a free kick in the attacking half. Corner, West Bromwich Albion. Conceded by Antonio Rüdiger. Goal! Chelsea 2, West Bromwich Albion 0. Victor Moses (Chelsea) left footed shot from the centre of the box to the centre of the goal. Attempt blocked. Álvaro Morata (Chelsea) right footed shot from outside the box is blocked. Assisted by Pedro. Substitution, Chelsea. Álvaro Morata replaces Olivier Giroud. Grzegorz Krychowiak (West Bromwich Albion) wins a free kick in the defensive half. Attempt missed. Jonny Evans (West Bromwich Albion) header from the centre of the box is just a bit too high. Assisted by Matt Phillips with a cross following a corner. Corner, West Bromwich Albion. Conceded by Thibaut Courtois. Attempt saved. Salomón Rondón (West Bromwich Albion) right footed shot from the right side of the box is saved in the bottom right corner. Attempt missed. Victor Moses (Chelsea) right footed shot from the right side of the box is high and wide to the right. Assisted by Eden Hazard. Offside, Chelsea. Davide Zappacosta tries a through ball, but Olivier Giroud is caught offside. Nick Bright & special guests Harry Judd, Adele Roberts and Cel Spellman bring you all the stories, goals, five-a-side action and fun from the FA People's Cup first round.